Trump has accomplished a lot without much help from Congress – the dismantling of the regulatory state, getting rid of criminal aliens, war against ISIS, etc. However, we still have a long way to go. Yes, he has modified some of his positions, but all in all, he has pursued more conservative policies than any president since Reagan and this administration is not even six months-old. Anyone who says otherwise is not taking the time to see the whole picture, living under a rock, or a libturd. Think about what he could do if the Republicans could get their act together and work together on moving forward and getting things done! Think what he could do if he would go on the ATTACK and put this Trump-Russian nothing-burger to bed. Going on the ATTACK by getting a special counsel to pursue investigations into Fast and Furious, Benghazi, the IRS targeting scandal, the Clinton e-mails scandal, the Clinton Pay for Play Foundation, particularly the Uranium deal, the Obama surveillance of the Trump campaign and the Obama inspired leaking and unmasking of Trump officials to discredit this administration. There are just so many things that could be cleared up and put to rest if the Republican party could get their freaking act together and stop being such cowards. I mean, I still want to know about Seth Rich and why the Democrat fascists are so afraid of getting to the bottom of that case and finding his murderer(s). That makes NO SENSE! Unless…nevermind. You see there is so much more to do and what he has done so far in just these past 6 months, despite the sabotage, hate and spiteful moves against him…has been impressive to say the least. Trump is a disciple of Norman Vincent Peale … the words “impossible” and “can’t” aren’t even in his vocabulary. So, there is that. Anyhow, this is what is happening now….these are exciting times folks! President Donald Trump met with his cabinet on Monday, giving Americans an update on everything his administration is doing to make the country better. Mr. Trump boasted that despite Democrat opposition, his administration had already accomplished a great deal, citing positive economic numbers. He pointed to the unemployment numbers at a 16-year low, nearly $4 trillion in worth created in the stock markets, and 700,000 jobs created since the election. The public nature of the meeting allowed the president to refocus on his agenda, looking beyond the ongoing media obsession with the Russian investigation and accusations that he tried to obstruct justice by firing FBI director James Comey. The president also discussed progress in Congress surrounding his legislative agenda — replacing Obamacare and passing a big tax reform package. “Mitch McConnell is working very, very hard, as are the Republican Senators,” Trump said. 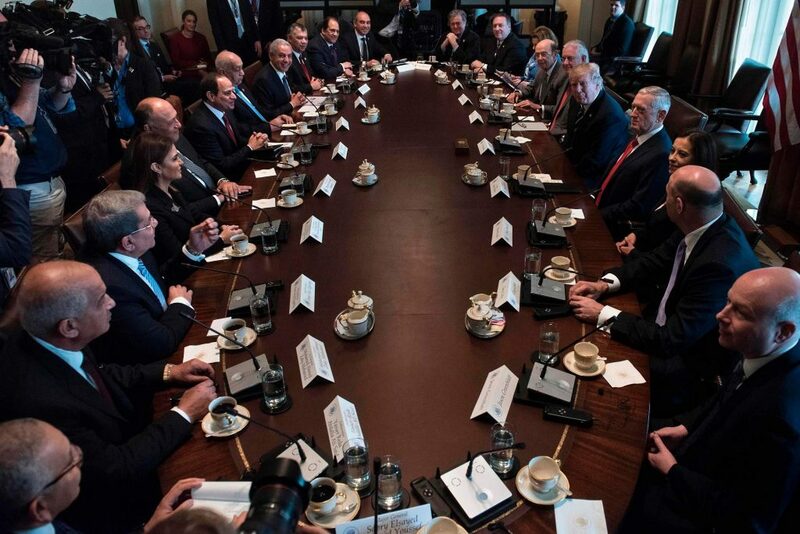 Trump sat at the table in the Roosevelt Room with Secretary of State Rex Tillerson sat at his right and Defense Secretary James Mattis sat at his left. After his remarks, he asked each of his cabinet members to talk about the things they were working on to make Americans lives better. Yes, please do that. Work VERY hard EVERY day to accomplish making the American dream into a reality for her people.